A binary search tree or BST is a popular data structure which is used to keep elements in order. 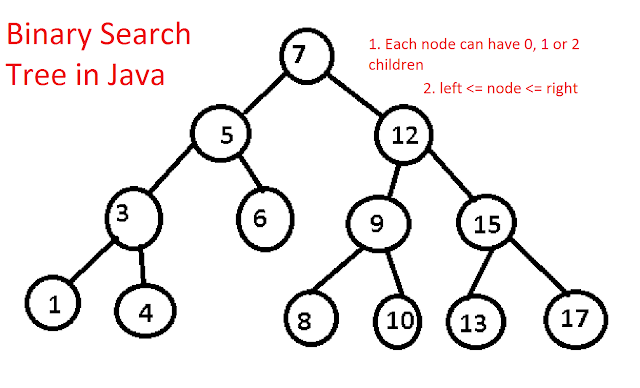 A binary search tree is a binary tree where the value of a left child is less than or equal to the parent node and value of the right child is greater than or equal to the parent node. Since its a binary tree, it can only have 0, 1 or two children. What makes a binary search tree special is its ability to reduce the time complexity of fundamental operations like add, remove and search, also known as insert, delete and find. In a BST, all these operations (insert, remove and find) can be performed in O(log(n)) time. The reason for this improvement in speed is because of the unique property of binary search tree, where for each node, the data in the left child is less than (or equal) and the data in the right child is greater than (or equal) to the data in said node. In Programming interviews, you will see many data structure and algorithmic questions based upon binary search tree e.g. check if a binary tree is a BST or not? Or, write a program to check if BST is balanced or not. In order to solve that problem, you must know how to implement BST in Java. In this tutorial, I will teach you how to implement a binary search tree in Java, which you can use to solve any binary search tree or binary tree based coding problems. Here, You will learn how to create a binary search tree with integer nodes. I am not using Generics just to keep the code simple but if you like you can extend the problem to use Generics, which will allow you to create a Binary tree of String, Integer, Float or Double. Remember, you make sure that node of BST must implement the Comparable interface. This is what many Java programmer forget when they try to implement binary search tree with Generics. Here is an implementation of a binary search tree in Java. It's just a structure, we will subsequently add methods to add a node in a binary search tree, delete a node from binary search tree and find a node from BST in the subsequent part of this binary search tree tutorial. In this implementation, I have created a Node class, which is similar to our linked list node class, which we created when I have shown you how to implement linked list in Java. It has a data element, an integer and a Node reference to point to another node in the binary tree. 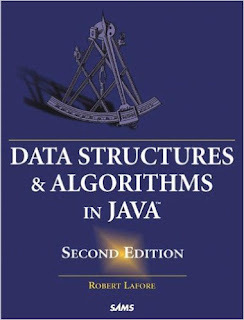 For a curious developer who wants to learn advanced data structure in Java, I also recommend checking out Data Structures and Algorithms in Java, 2nd edition, one of the rare book where you will find examples in Java. Here is the sample code to create a binary search tree or BST in Java, without using any third party library. * left the child and less than or equal to its right child. * best, average and worst case. * Java function to return number of nodes in this binary search tree. * Java function to clear the binary search tree. That's all in this tutorial about how to implement binary search tree in Java. In this tutorial, you have learned to create the structure of BST using Node class and some basic function. In next couple of tutorials, you will learn some more interesting things with BST e.g. writing a method to add Nodes in BST, this method must make sure that property of binary search tree is not violated. I mean, it first needs to find a right place and then needs to add the element. Subsequently, you will also learn how to search a node in binary search tree. If you are interested in learning Data structure and Algorithm in Java Programming language then you can following books which have several examples of the tree, linked list, heap and other advanced data structure in Java. please put some more algorithm questions and how they can be implemented in java or else the explanation to various algorithms and why they are so popular? Hello @Jane Rose, glad to hear that you like this article about binary tree in Java. Don't forget to share with your friends, it helps a lot. Will the BST allows child value equal to it's parent? I read somewhere that this is a special case and we need to handle this specially? Hello kadam, if duplicate keys are allowed in binary search tree (BST), then nodes with values that are equal to the key in node n (parent node) can be either in n's left subtree or in its right subtree (but not both).